Established on August 7, 1987 the goal of the Federation Geido Tao Chi Kihon has been the promotion of Chi Ryu Aiki-Jujitsu and those martial arts that are connected with it. Here the arts of Iaido, Jodo, Judo, Ju-Jitsu and Okinawa Kobudo have to be named. Since that day the number of members has been risen continously. Due to the dedicated work of Shihan Jhonny Bernaschewice dojos in Belgium, Germany, Poland, The Netherlands, Switzerland, and Italy are following path of martial arts along with us. Students following one of our systems are usually recognized not only by their quality of technical skills but also by their dedication and willingness to obey the etiquettes for practicioners of martial arts. What makes our Federation different from others? Try to find it out for yourself by contacting us or an affiliated dojo in your neighbourhood. The badge is a red triangle carrying two circles (a white and a red one). The red triangle symbolizes the basic principle of our techniques. Three Yin-Yang symbols are moving inside the red circle on a white background each carrying a tail to express the movement. Besides this the badge carries a white fan in the left corner elucidating that there is no stagnation in the tao, everything is floating and moving. The Kanji in the right corner of the badge says Ju-Jitsu and is an explanation of the art we do. 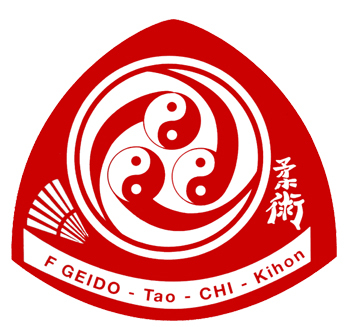 Below the two circles one finds a white banner carrying the name of the federation "F GEIDO-Tao-CHI-Kihon". For a suitable explanation of the federations name one has to look at the meaning of the used terms.